Montgomery's one-year contract is a veteran minimum deal with a $90,000 signing bonus, Manish Mehta of the NY Daily News reports. Montgomery is signing a one-year contract with the Jets, Adam Schefter of ESPN reports. Analysis: The division rival Dolphins were expected to meet with Montgomery on Friday after the running back met with the Jets on Thursday, but it's now evident New York isn't letting him slip away. With shaky depth behind Le'Veon Bell, Montgomery initially enters the Jets backfield as a legitimate candidate to open the season as the No. 2 running back. He'll compete with Elijah McGuire, Trenton Cannon and De'Angelo Henderson. Montgomery is expected to visit the Jets on Thursday, Field Yates of ESPN reports. Montgomery had 15 carries for 83 yards and added 10 catches for 65 yards after joining the Ravens in November. Montgomery is active for Saturday's game against the Chargers. Analysis: Montgomery was inactive in Week 15, but has seemingly jumped Javorious Allen on the depth chart, as it's the latter who is inactive Saturday. Montgomery still figures to face an uphill battle for touches with both Gus Edwards and Kenneth Dixon doing well in recent weeks. Montgomery (coach's decision) is inactive for Sunday's Week 15 tilt against the Buccaneers. Analysis: Montgomery appeared to carving out a meaningful role in the Ravens offense just two games ago, but he logged just three touches in Week 14, Kenneth Dixon's second contest back from injured reserve. Dixon's strong showing over the last pair of contests almost assuredly played a pivotal role in Montgomery's inactive status Sunday. Montgomery took two carries for one yard and caught one of three targets for one yard in Sunday's 27-24 overtime loss to the Chiefs. Analysis: Montgomery played 19 of 71 snaps (27 percent) on offense, splitting work with Gus Edwards (31 snaps) and Kenneth Dixon (23). While he seems to be the preferred running back for obvious passing situations, Montgomery has averaged just 4.3 carries and three catches the past three weeks, and he still hasn't scored a touchdown with the Ravens. He's unlikely to see a major boost in workload Week 15 against Tampa Bay. Montgomery caught five of seven targets for 42 yards and added 13 yards on three carries during Sunday's 26-16 win over the Falcons. Montgomery ran for 51 yards on eight carries and added three catches for 13 yards on three targets against the Raiders. Montgomery picked up five yards on a lateral play during Sunday's 24-21 win over Cincinnati. Montgomery is active for Sunday's game against the Bengals. Analysis: He'll join a Baltimore backfield led by Alex Collins, that also includes Javorius Allen and Gus Edwards. Montgomery's ability as a pass catcher and blocker should prove to be an asset to the Ravens, but he'll be a speculative fantasy play until it's established that he's a key cog in the team's passing attack. Coach John Harbaugh said Wednesday that Montgomery's status for Sunday's game against the Bengals will depend on how he looks in practice this week, Clifton Brown of the Ravens' official site reports. Montgomery (coach's decision) is inactive for Sunday's game against the Steelers, Jamison Hensley of ESPN.com reports. Coach John Harbaugh said Wednesday that Montgomery could "possibly" play in the Ravens' Week 9 game against the Steelers, Jamison Hensley of ESPN.com reports. The Packers traded Montgomery to the Ravens for a 2020 seventh-round pick Tuesday, Adam Schefter of ESPN reports. Montgomery had two carries for six yards and one reception for two yards in Sunday's loss to the Rams. He also lost a fumble on a kick return late in the game. Montgomery had four carries for 12 yards and a touchdown and two receptions for 10 yards in Monday's victory over the 49ers. Montgomery had four carries for 15 yards and one reception for 23 yards in Sunday's loss to the Lions. Montgomery had five carries for 18 yards and two receptions for 56 yards in Sunday's victory over the Bills. Analysis: Montgomery played 20 snaps Sunday, the third most among Packers running backs, but that was still enough for him to make an impact, most of which came on a 43-yard reception. The Packers have split the snaps among Montgomery, Jamaal Williams and Aaron Jones fairly evenly since Jones made his season debut in Week 3, and all have been effective, so that plan could continue in order to give defenses multiple looks and keep all three backs fresh and healthy. Montgomery had four carries for 16 yards and six receptions for 48 yards in Sunday's loss to the Redskins. Packers head coach Mike McCarthy said Wednesday that Montgomery and Jamaal Williams "will be in the first slot" among the team's running-back group this week, despite Aaron Jones' (suspension) reinstatement to the active roster, Rob Demovsky of ESPN.com reports. Montgomery had five carries for 31 yards and one reception for nine yards in Sunday's tie with the Vikings. Analysis: Montgomery had a couple nice runs in Sunday's contest, but he was still the second option in the Packers' backfield, playing 26 snaps to Jamaal Williams' 47. Montgomery has averaged 24.5 snaps per game through two weeks, but that number could fall a bit moving forward, as fellow running back Aaron Jones has completed a two-game suspension and will presumably cut into the playing time of both Montgomery and Williams. Montgomery had two carries for seven yards and two receptions for 21 yards in Sunday's victory over the Bears. He also returned two kicks for 47 yards in the contest. Montgomery says the foot issue that forced him out of Friday's preseason game is not a concern, Rob Demovsky of ESPN.com reports. "I'm not injured," the running back declared Sunday. Analysis: Good news for the Packers, with Jamaal Williams bouncing back from an ankle issue and Aaron Jones suspended for the first two games of the regular season. Jones' upcoming absence could pave the way for Montgomery to see added touches early on, but Williams remains the favorite to head the team's backfield in Week 1. Coach Mike McCarthy said Montgomery's foot injury is "nothing of a serious nature," Ian Rapoport of NFL Network reports. Montgomery left Friday's preseason game against the Raiders with a foot injury, Michael Cohen of The Athletic Wisconsin reports. Analysis: Montgomery went straight to the locker room with a trainer. He was working as a running back and return man during the exhibition contest. His spot with the team is secure after rushing 71 times for 273 yards and three touchdowns while catching 23 passes for 173 yards and one score in 2017. The injury is worrisome, however, since starter Jamaal Williams is already nursing an ankle injury. Montgomery had four carries for 10 yards and two receptions for 13 yards in Thursday's preseason game against the Steelers. Montgomery rushed three times for nine yards and failed to catch either of his two targets during Thursday's 31-17 win over the Titans in the preseason opener. Montgomery is getting most of the work with the starting offense in two-minute and no-huddle situations early in training camp, Rob Demovsky of ESPN.com reports. Montgomery remains a part of the Packers' "running back-by-committee," Rob Demovsky of ESPN.com reports. "Ty can play from the backfield and still has the ability to flex him out and get the matchups we're looking for," head coach Mike McCarthy said Monday. Montgomery (wrist) participated in the first session of OTAs on Tuesday, Ryan Wood of the Green Bay Press-Gazette reports. Packers head coach Mike McCarthy said Wednesday that Montgomery (wrist) is still considered a running back, but could be earmarked for more of a hybrid role as a back/receiver if he can stay healthy in 2018, Rob Demovsky of ESPN.com reports. Montgomery (ribs), who was placed on injured reserve Friday, will undergo wrist surgery in the coming days, Ian Rapoport of NFL Network reports. Analysis: Though Montgomery was ruled out for his third straight game Sunday against the Buccaneers due to the rib injuries before being shuttled to IR, it appears his need for wrist surgery was the primary reason behind the transaction. Montgomery should be fully recovered from both issues by the time training camp commences next summer, but the Packers will be forced to ride out the current season with Aaron Jones and Jamaal Williams as their primary running backs. The Packers placed Montgomery (ribs) on injured reserve Friday. Montgomery (ribs) has been ruled out for Sunday's game against the Buccaneers. Analysis: Montgomery hasn't practiced since aggravating his rib injury in Week 10, so it comes as no surprise that he'll miss a third straight game. Jamaal Williams appears to be the favorite to lead the Packers' rushing attack this week, but Aaron Jones (knee) could return from a two-game absence and have a role in the team's game plan, too. Montgomery (ribs) was listed as a non-participant for Thursday's practice, Tom Silverstein of the Milwaukee Journal Sentinel reports. 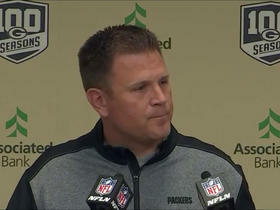 Montgomery (ribs) was limited to rehab work at Wednesday's practice, Ryan Wood of the Green Bay Press-Gazette reports. Analysis: With Montgomery and Aaron Jones (knee) both not yet practicing fully to begin the week, Jamaal Williams is tentatively positioned for another game in a workhorse role out of the backfield. 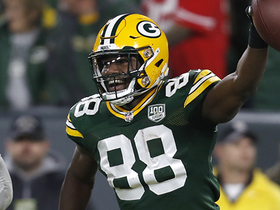 The Packers do still hope to get Montgomery and Jones back at practice Thursday or Friday, which might give one or both of them a chance to play Sunday against the Buccaneers. Montgomery (ribs) is listed as inactive Sunday in Pittsburgh, Jason Wahler of the Packers' official site reports. Analysis: Evidently, Montgomery didn't do enough during Saturday's session to overcome his lack of practice reps during the week. The Packers also won't have the services of Aaron Jones (knee), and fellow rookie Devante Mays is coming off an ankle injury, which leaves Jamaal Williams almost unimpeded access to touches against the Steelers' eighth-ranked run defense. Montgomery (ribs) is listed as doubtful for Sunday's game in Pittsburgh, Rob Demovsky of ESPN.com reports. Analysis: Montgomery didn't practice Wednesday, Thursday or Friday, but Packers coach Mike McCarthy said the running back will have one last opportunity Saturday. The team's decision to list Montgomery as doubtful suggests he isn't expected to play even if he manages some degree of participation Saturday. Jamaal Williams is set to lead the backfield again, with Devante Mays (ankle) and fullback Aaron Ripkowski working in supporting roles. Head coach Mike McCarthy said that Montgomery (ribs) will need to practice Saturday in order to play in Sunday's game against the Steelers, Rob Demovsky of ESPN.com reports. Analysis: Montgomery is making progress with his recovery, but it is of the slow variety, and he will continue to rehab Friday rather than practice. McCarthy's comments leave the door open for Montgomery to play this week, but things are not looking promising. If Montgomery remains out Sunday, Jamaal Williams would again serve as the Packers' top running back. Montgomery (ribs) was a non-participant on the Packers' injury report Thursday. Packers head coach Mike McCarthy said Wednesday that Montgomery (ribs) would start the week of practice with the rehab group, Mike Spofford of the Packers' official site reports. Montgomery (ribs) has been ruled out for Sunday's game against the Ravens, leaving Jamaal Williams to lead the Green Bay rushing attack, Michael Cohen of the Milwaukee Journal Sentinel reports. Analysis: With Aaron Jones (knee) already expected to miss multiple weeks, the Packers held out some hope until Friday that Montgomery might be able to avoid an absence. Montgomery's failure to practice in any capacity this week suggests he's also in some danger of missing a Week 12 game against the Steelers. After Williams, Devante Mays and fullback Aaron Ripkowski are next in line to handle the backfield work Sunday. Head coach Mike McCarthy said Friday that he thinks Montgomery (ribs) will miss Sunday's game against the Ravens, Rob Demovsky of ESPN.com reports. Analysis: McCarthy added that Montgomery's latest setback with his ribs is not a "long-term concern," but it's apparently a week-to-week one at least, and all signs are pointing to the Packers being without their top two running backs -- fellow running back Aaron Jones (knee) will also sit out -- Sunday. If that turns out to be the case, expect rookie Jamaal Williams to serve as the top running back and take on a heavy workload, with fellow first-year back Devante Mays acting as Williams' backup. Montgomery (ribs) remained sidelined at Thursday's practice, Michael Cohen of the Milwaukee Journal Sentinel reports. Analysis: The listing is no surprise after head coach Mike McCarthy told Wes Hodkiewicz of the Packers' official site that Montgomery was slated for rehab work Thursday. Montgomery thus has one more opportunity to make an appearance in drills this week, a development that would keep the door ajar for active status Sunday against the Ravens. He seems like a better bet to join Aaron Jones (knee) in street clothes, though, leaving Jamaal Williams and Devante Mays to spearhead to the ground game. Packers head coach Mike McCarthy said prior to Thursday's practice that Montgomery (ribs) would be limited to rehab work, Wes Hodkiewicz of the Packers' official site reports. Analysis: That means that Montgomery will likely be listed as a non-participant in practice for the second straight day, which isn't the most encouraging of signs for his ability to suit up Sunday against the Ravens. Even if Montgomery is able to push through the rib injury -- which he aggravated in the Week 10 win over the Bears -- and play Sunday, the Packers could look to limit his reps, potentially opening the door for rookie Jamaal Williams to serve as the team's lead back during the contest. Montgomery (ribs) was a non-participant at Wednesday/s practice, Michael Cohen of the Milwaukee Journal Sentinel reports. Packers coach Mike McCarthy believes Montgomery (ribs) has a shot to play in Sunday's game against the Ravens, Michael Cohen of the Milwaukee Journal Sentinel reports. Montgomery won't return to Sunday's contest at Chicago due to a rib injury. 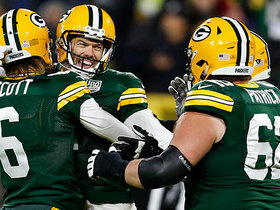 Montgomery is locked into a regular role on passing downs for the Packers, Rob Demovsky of ESPN.com reports. Montgomery rushed five times for 33 yards in Monday night's 30-17 loss to the Lions. He also caught his lone target for 18 yards. 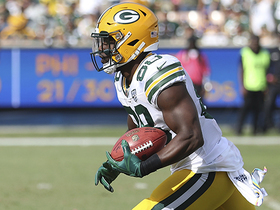 Analysis: Montgomery not only saw the same amount of carries as Aaron Jones, but he also totaled 40 more offensive yards than the rookie. After sliding behind Jones on Green Bay's depth chart, Montgomery's performance Monday, although rather mild, will make the team's share of backfield touches interesting to monitor in Week 10 against the Bears. As long as Brett Hundley is at the helm, it wouldn't be surprising if both Montgomery and Jones are mixed in to help keep the Packers' ground game fresh. 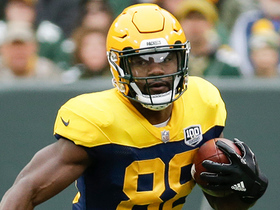 Green Bay Packers general manager Brian Gutekunst explains why he made the decision to trade away running back Ty Montgomery to the Baltimore Ravens and why he is confident in his current team. 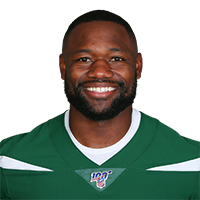 NFL Network's Ian Rapoport breaks news that running back Ty Montgomery has been traded from the Green Bay Packers to the Baltimore Ravens in exchange for a 2020 7th-round draft pick. Green Bay Packers running back Ty Montgomery fumbles on a kick return late in the fourth quarter and the Los Angeles Rams recover it. 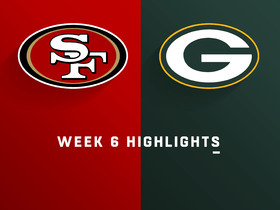 Watch the highlights from the Week 6 matchup between the San Francisco 49ers and the Green Bay Packers. 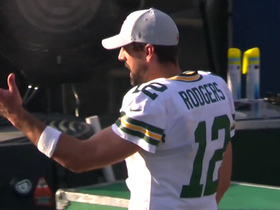 Watch every play from the Green Bay Packers' game-winning drive in Week 6. Green Bay Packers running back Ty Montgomery catches a 2-yard pass from quarterback Aaron Rodgers for the Packers' first touchdown of the game. Green Bay Packers quarterback Aaron Rodgers tosses a short pass to running back Ty Montgomery who turns the play into a 23-yard gain. 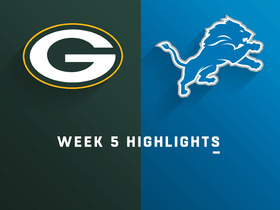 Watch the best play from the Week 5 matchup between the Green Bay Packers and Detroit Lions. Green Bay Packers quarterback Aaron Rodgers finds running back Ty Montgomery for a 43-yard gain.